Brooklyn Brewery är alltid aktuella men än mer aktuellt blev bryggeriet tack vare deras rejäla satsning i Stockholm där en form av öl&mat-komplex just nu håller på att byggas tillsammans med Carnegie och Carlsberg Sverige i form av Nya Carnegiebryggeriet Många i ölsverige blev naturligtvis helt till sig i trasorna av denna storslagna nyhet och så även vi, detta är ett ställe som vi kommer att hänga mycket på när det öppnat, vilket planeras till senare delen under 2013. 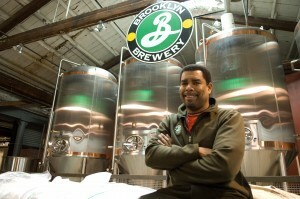 Det har rapporterats en hel del kring detta så vi ska inte kika så mycket på det idag utan helt enkelt åter ta en pratstund med Brooklyn Brewery’s head brewer, Garrett Oliver. MB: Hey Garret! Nice to chat with you again, we had a blast when we met in Stockholm over food, great beers, stories about you trying to steal trains after GABF and the great Cheese Wars afternoon at Restaurangakademin! 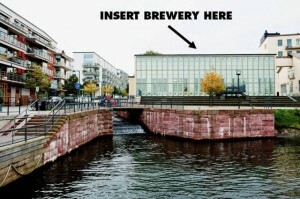 We have seen you around in Sweden a few times now, which we think is awesome, it is quite unique for a head brewer at an American craft brewery to come here outside of Stockholm Beer & Whisky Festival – but what are the reasons that you visit us so often? GO: Magnus, what happens at GABF stays at GABF! Anyhow, that was a long time ago, and I was only going to borrow the train. Yes, I’ve already been to Sweden so many times that the antique glassware dealers in Gamla Stad all know me! And you’ll see a lot more of me soon, that’s for sure. We started in Scandinavia with House of Beer in Denmark after I won the Semper Ardens Pris for Beer Culture in 2004. House of Beer eventually went off the rails in Denmark, but Sweden has become a second home for us. Stockholm has a lot in common with Brooklyn, and you speak better English than we do. MB: When will we get the chance to see you again in Sweden? GO: I will be in Stockholm and Göteborg in April, and I’m looking forward to it. I haven’t visited Göteborg, which is hear is a very cool place. MB: Gothenburg is quite nice, loads of herring and extremely poor puns everywhere. The beer world in Sweden recently got a lot larger (or smaller?) when the news about the collaboration with Carlsberg/Carnegie and Brooklyn Brewery hit us early January and it became a huge news story both in Swedish and in US media. We already know that Sweden is Brooklyn Brewery’s second largest market after Manhattan, NY, but what else actually triggered these plans and how did it start? GO: Reviving the Carnegie brand and starting a small brewery has been a dream for Carlsberg’s Joakim Losin for years. He is good friends with our owner/General Manager Eric Ottaway, and they started discussing it seriously over beers more than a year ago. Slowly the whole thing came together, and here we are. Everyone here is really excited about New Carnegie. MB: Can you let us in a little on the journey from the idea to the press release of this collaboration? How did the process look? GO: Ha! That would be a very long answer. But Joakim Losin has been the driver of this project from the start. Once he found the site, real planning started with Eric Ottaway. Of course I was mostly concerned with the brewing side, but we’ve been discussing every aspect of the operation there. I want to make sure that we can do some really fun things at New Carnegie, so I’m looking to make sure that our equipment and space are very flexible. MB: You will have an experimental kitchen at the new brewery in Stockholm, and you are one of the worlds most renowned beer/food pairing evangelists. What is the most common mistake people do when they pair craft beer and food, and what makes a truly great pairing? GO: Certainly there will be some elements of the “experimental” in the kitchen, but we also just want people to be able to come to New Carnegie, hang out, and enjoy some great food and beer. As for pairing “mistakes”, I do think that beer is usually more forgiving than wine, and it’s easier to find truly great pairings with food. Beer always provides some contrasting elements to food flavors – malt sweetness, bitterness and carbonation are the main elements that contrast. We can stick with contrast, of course, and that can be very pleasant. But the best pairings also contain elements of harmony – parts of the beer’s flavor that echo flavors in the food. And because beer is far more varied in flavor than wine, those harmonies are easier to find. MB: Other craft brewers we have met and spoken to are usually quite impressed over the interest and knowledge of the Swedish craft beer consumer, what’s your thoughts on this? GO: Well, the Swedish beer consumer has had access to great beer for a long time now, and it’s getting better fast. The Stockholm Beer and Whisky Festival, Akkurat, Oliver Twist – these are institutions that anywhere in the world would be lucky and proud to have. So I’m not surprised that Swedish beer drinkers know their stuff. And having perfect English doesn’t hurt – Swedes have access to a lot of English-language beer writing online. 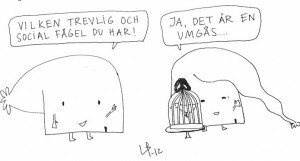 I’m starting to be able to read a lot of Swedish, but I can’t pronounce anything! GO: This argument is highly emotional for craft brewers, but it may be producing more heat than light. The basics are simple: there are international brewing conglomerates in our markets who are masquerading as us. They hide their true identities because they know that people like craft brewers and they don’t feel the same about, say, AB-InBev. We find this offensive, but the big brewers say “it’s all about the beer, so let the consumer decide.” I think that the marketing is plainly deceptive, and that bothers me. I am not bothered, however, by the fact that big brewers want to make craft-style beer. In fact, you could argue that they have a responsibility to their shareholders to make craft-style beer, because there will not be any growth in industrial beer. Craft beer is winning, and when you’re winning, people are going to copy you. But that’s not the same as pretending that you’re somebody else. MB: Brooklyn Brewery suffered from a great loss in 2012, the brewery cat Monster passed away to cat heaven and is probably sipping Brooklyn Brewery Monster Barleywine there instead, any plans for a cool Monster Tribute version or similar tribute? GO: Yes, we miss Monster greatly, but he had the best life of any cat on the planet, so we try not to be sad about it. He had a great run! I have a few ideas about a tribute, but I will keep them under my hat for now. MB: What’s your predictions for the beer year 2013? What will be the trends locally and globally? GO: I get to travel a lot, and what I see is craft beer ascendant all over the world. What people should understand is that the rise of craft beer is not a trend or a fad – it’s a return to normality. The weird period was the middle of the last century, when the United States had only one kind of beer, and Sweden was hardly doing better. Now things are simply returning to normal, and there’s a long way to go still. I think you’ll see continuing interest in IPAs, but also a lot of interest in very flavorful session beers, sours, barrel-aged beers, and beers made with wild yeasts. Of course, all of these are things from brewing’s past. Brewing is like writing music. You have a lot of inspirations, and most of creativity is in dynamic recombination of elements to create something exciting. I’m looking forward to finding new inspirations in Sweden! MB: Thank you so much for your time, Sweden looks forward to see you again in April! GO: My pleasure! See you soon! Garrett kommer till Sverige (Stockholm och Göteborg) i slutet av april, vecka 17. På agendan för Stockholmarna står ännu en härlig tap-take over på Akkurat, ölprovning och middag på Urban Deli samt American Table på Clarion Hotel Sign och i Göteborg blir det, om allt går som det ska, ett Brooklyn Brewery event på Clarion Hotel Post.